After several months of preparations, Pastiche Steel Ensemble walked on stage to perform in front of hundreds of steelpan performers, scholars, and aficionados from around the world at the International Conference and Panorama in Trinidad and Tobago (ICP). Pastiche strives to take the steelpan to a new level through composing and premiering new works, experimenting with different sounds on the steelpan, and even implementing new instrumentation into the steel ensemble. The first step onto this path was the Virtual Steelband. The idea was taken from Eric Whitacre’s Virtual Choir, which featured singers from all over the world performing together via the internet. The Virtual Steelband was an exciting new project for the group as to the best of their knowledge, this had never been done before in the steelpan world. Not only was it an opportunity to try something new, but through technology they were able to bring together the vastly expanding steelpan community. Premiering the world’s first Virtual Steelband at the first ever International Conference and Panorama seemed like the ideal arena. Through the help of Keith Diaz, president of Pan Trinbago, Pastiche was quickly introduced to the ICP Steering Committee. In April 2014, they began interacting with Roslyn Cummings, head of the ICP secretariat, and her committee who accepted our proposal. As an ensemble, Pastiche not only strives for excellence, but also aims to leave a lasting impression on its audience members. This instance was no different. Pastiche Steel Ensemble in concert at the ICP was not simply a showcase of specific repertoire of music followed by the Virtual Steelband premiere, it was a story. Pastiche chose to showcase the geographical life of the steelpan beginning with the instrument's roots in Trinidad and expanding to various countries in which it now calls home. As the steelpan has been graciously accepted by many countries all over the world, Pastiche limited its focus to countries that its performers come from including Trinidad, the United States, and Japan. The final segment of the Pastiche performance focused on steelpan repertoire of today and beyond. In this section they performed pieces that incorporated uncommon items for the steelpan community such as iPads, scrap metal, chopsticks, and wire brushes to mirror contemporary performances that are happening around the world and places that the steelpan is moving too. The show received rave reviews and sparked interest in a Pastiche U.S. Tour which is in its planning stages for October 2016. The ensemble has booked locations such as Oxford, OH and Orlando, FL just to name a few. 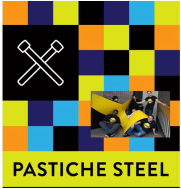 Pastiche is also currently preparing for their second Virtual Steelband, a project they hope to continue for many years to come.